Ric Moylan was born in Hulme; an extremely proud mancunian, he has lived all his life in Manchester. 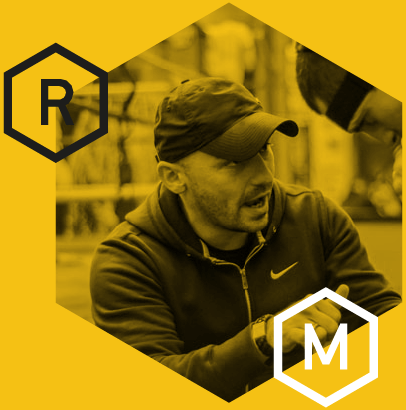 With almost 20 years experience, Ric is regarded as one of the leading performance coaches in the UK and is the coach and advisor for numerous elite level professional athletes and high profile individuals. He works with former WBA World Champion Scott Quigg and ATP tennis player Liam Broady amongst many others in all aspects of their physical development and mindset performance.Ric spent 4 hugely enjoyable years working with Team Ricky Hatton working alongside Ricky and fighters such as former World Champion Anthony Crolla and current 2 X World Champion Ryan Burnett. Other fighters such as WBC World Champion Tony Bellew, and former British and Commonwealth Champion Frankie Gavin have also turned to Ric for guidance and improvement in their performance. Ric has also coached athletes from a wide range of other professional sports from superbike racing, to world champion tug of war! Ric is now using his experiences from elite sport to support leaders and managers from the corporate world travelling the UK delivering keynote speeches and seminars on subjects such as improving your performance, becoming a stronger leader, controlling fear during extreme pressure, and what Ric has named The Deadline Mindset. Groups ranging from university students, CEO’S, company owners and even senior officers in the police force, have all shown huge performance increases from being coached by Ric. Ric is an active health, fitness, performance and leadership writer for successful magazines and publications, where he shares his years of knowledge, experience and top tips, gained from working at the highest levels of sport. Last but by no means least, in loving memory of his 12 day old niece Soffia, Ric is the proud creator of Charity Boxing Nights, supporting and fundraising for each and every one of the amazing people on the Newborn Intensive Care Unit at St Mary’s Hospital in Manchester.